One of my favorite Instagram accounts is Unveil (if you haven’t checked them out yet, what are you waiting for? Click the link!). Every picture they post asks you a different question that makes you think about life,the future, relationships etc…designed to spark a conversation. A few weeks ago I saw a post about their new dating app called Unveil. You see, Unveil is not your usual dating app where you go through profiles waiting for pictures to catch your eye. You have to interact with people using voice messages (little conversations) to get to know people and reveal their picture. Unveil is very simple to use. It provides a new way to interact and meet people. It gives you the opportunity to “click” with someone on a whole new level by hearing their voice and giving you the chance to connect with them based on personality. The exchange of voice messages will allow you to see the person’s profile picture (and for them to see yours). I had fun using Unveil and would recommend it to everyone that wants to try a different kind of dating app. Just talk and have some fun! To download Unveil you can visit their website Here. Logo picture is property of the Unveil team. All other pictures are screenshots (personal phone). The opinions on this post are based on my personal use of the app and do not represent the opinion of the Unveil team. A year ago on this very month I was dreading the inevitable: my bf had to join the military and was leaving in October (2015). The weeks leading to that event weren’t easy for me. I wondered each and every night what my reaction would be when he left. I knew I was going to cry even when I told myself (and him) that it was ok, it was just days. It wasn’t ok. The day he left we spent the afternoon talking, laughing and trying to convince the other that we weren’t nervous. We failed. I couldn’t stop crying. In fact, I cried for days after he left. I texted him every single night knowing that his phone was off hidden somewhere in his room. I had faith that one of those nights those messages would be marked read. It wasn’t just days. That first time, I had to wait for weeks. Praying and wishing for him to be safe, in a good place and just waiting for my messages to be marked read. I felt down for weeks and had to get used to the fact that he wasn’t going to be there all the time. 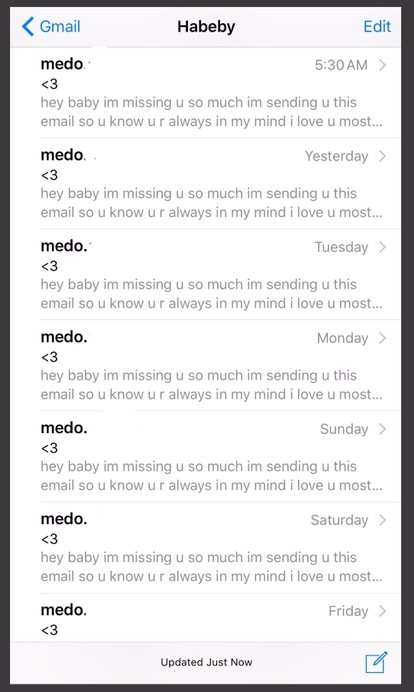 He even programmed one of those services that send you an email every day just so he could say that he loved me. Never underestimate the power of a double check mark in an app. Yeah, I cried the day those messages were marked read right when I was texting. Best feeling ever after so many days. Time is the best healer. October 2016 will mark a year. Every time he leaves again after “holiday” has gotten a little bit easier. We can text or talk sometimes. I don’t cry anymore. I miss him every single time and I still pray for him to be in good places, with good people, SAFE.